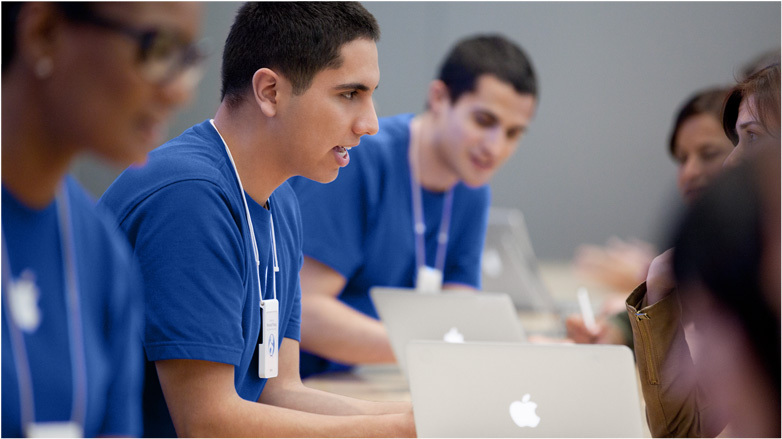 Apple will face a class action lawsuit brought against it by retail employees in California who were subjected to ongoing bag checks that often caused them to remain at work for 10 to 15 minutes after their shifts had ended, reports Reuters. Employees allege Apple subjected them to mandatory bag checks that were "embarrassing and demeaning," and were conducted off the clock, leaving them uncompensated for their time. The group is seeking damages for unpaid wages, unpaid overtime, and other recompense. The lawsuit was first filed in 2013 and after some legal hurdles that included a 2014 dismissal, it was granted class action status today by U.S. District Judge William Alsup in San Francisco. Class members participating in the lawsuit include more than 12,000 of Apple's current and former employees in the state of California. Amanda Friekin and Dean Pelle, the plaintiffs who filed the lawsuit, claim Apple's bag checks were mandatory each time a sales rep left the store and were put in place to discourage theft. Several employees subjected to these bag searches emailed Tim Cook in 2012, writing that managers were "required to treat 'valued' employees as criminals" and that the searches were often performed "in front of gawking customers." Over the course of the past two years, Apple has argued that the case should not get class action status because not all managers conducted bag searches and that the bag searches that did happen took so little time that compensation was not necessary. Now that it has received class action status, the lawsuit will go to trial. "the bag searches that did happen took so little time that compensation was not necessary"
That might be one of the worst legal arguments I've ever read. I hope Apple loses this case, this policy stops, and these hard working people get properly compensated. As someone who worked in retail for over a decade, bag checks are indeed common. However, bad management can lead to waiting an extended period of time before being checked. If the employee is off the clock and it eats into their break or commute, this is an issue that needs to be addressed. My opinion is that if it doesn't happen within a couple minutes of clocking out, it's a problem. Once someone clocks out, they're not on your time anymore, and that needs to be acted upon with respect. Managers will look for any excuse to deny employees raises or continued employment, including being a minute or two late or leaving a minute or two after their shift is over. Hourly employees have every right to demand that their off-clock time not be wasted, particularly since breaks are often scheduled and inflexible. If an employee has a half hour for lunch and they lose five minutes, that may actually cause them to have to change lunch plans, rush unnecessarily, or skip eating entirely. If an employee leaves at a certain time so they can go to a second job or work, then their manager's delay can negatively affect their performance elsewhere. Additionally, bag checks in front of customers should be avoided whenever possible. It can be demeaning and invasive. This is not a matter where one person gets to decide for the rest of the world what is an isn't embarrassing. People have different thresholds for that sort of thing. It's possible this issue is isolated to certain stores/regions, too. I had managers that never bothered with bag checks and managers that lived and died by them. I never performed them myself when I was a manager. I dread to think that Apple employees would use bags to store their loot when they could Win an AyeGear Jacket That Holds All Your Tech Gadgets ('https://www.macrumors.com/2015/05/08/macrumors-giveaway-ayegear-jacket/') instead! Clearly the managers that are conducting said bag checks in front of customers are the issue here. A simple opening of the top of the bag whilst a manager glances (in the back of the store) does not take up more than 10 seconds of time. The employees who take this personally should be explained to why it needs to be done and if they do not feel comfortable with it they should look elsewhere for employment. This is common in retail and I would be surprised if this case holds up. Good luck against the Apple lawyers. I've worked a lot of retail and this practice is common. Not saying it's not demeaning though. It always said a lot about how the company viewed its employees. If theft is going to happen, a simple bag check isn't going to deter it. Haven’t got a problem with that at all. It should happen on the company clock if it takes so little as to be unnoticeable. they won’t have a problem with it then will they? Having worked in retail for years most theft is from employees so checking them really shouldn't be an issue but doing it off the clock is. If there's a mandatory 15-20 min pat down of everyone at the end of the day/shift they should be compensated for that time. Amazon workers already unanimously lost this case in the U.S. Supreme Court. The Amazon employees got nowhere with this, I doubt this will hold up. Also, demeaning? I've worked at places that do this. I highly doubt it waster than a simple check. It doesn't take 15 minutes. Here's a novel idea.... Leave the backpack or purse at home. DUH! This is great when the entire world works according to your outlook and schedule. This is not how the real world works. Retail employees are often students or hold multiple jobs, and may rely on public transit. There may not be time in their schedule to return home between responsibilities.